Most states require a licensed driver or parent to ride passenger with their student driver for a certain number of hours. This helps the student to get practice on the road with some responsible supervision. If you are a parent, you will spend many of these hours in the car with your student, so here is a little survival guide for you. The last thing you want to do for your new driver is to scare them (or you as the parent) too much. Even if your driver feels ready to jump right into busy roads, it’s not a good idea. Start working on basics in a parking lot and move to neighborhood streets. After a bit of practice, try moving to slightly busier roads. Stick to familiar roads for the both of you. That way, you can know what to expect. As your teenager becomes more experienced, move to busy roads and eventually the freeway. While it won’t help you completely relax, it can help you know that they are paying attention to their surroundings. It also provides opportunities for you to teach your teen what they should be watching for while driving. Part of the reason you come along is to help teach your teen, right? If you have your phone handy, you can test their restraint by texting them every so often to see if they stay focused on the road. Use this as a teaching moment if they reach for their phone. Remind them how important it is to not use their phones even at stop signs and red lights. They should pull off the road and out of traffic if they need to use their phone. Bumper stickers and/or magnets that say “Caution: New Driver” or “Student Driver, please be patient” are available to purchase online and in some local stores. You can also make your own using some paper and a magic marker. 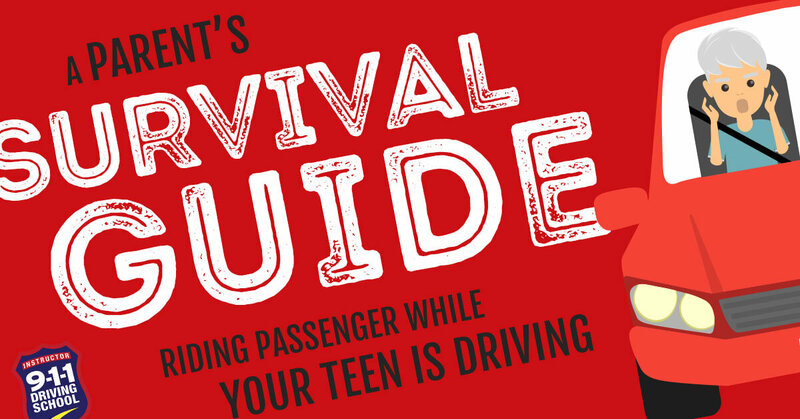 This helps other drivers be aware that your teen is still learning, and they should be patient and give them a little extra space. Behind every great driver is a parent who put in the hours and sweat to teach them. Make sure you buy yourself a reward, even if it’s a pack of gold stickers. It’s a big accomplishment for your teenager to get their driver’s license, but it’s also a big step for you too. Driver’s education teachers rely on parents to reinforce what students learn in class. These parent survival tips will help you be prepared for some common situations parent-passengers experience.